Foldio (a portmanteau of "foldable" and "studio") is portable photo studio with a foldable design for smartphones. Foldio allows anybody with a smartphone to easily take studio-quality pictures. Foldio is the world’s 1st portable studio (Mini studio) with foldable design for a smartphone. It is unfolding a whole new level of possibilities in smartphone photography. It is all-in one portable studio (mini studio) which enables everyone to take awesome, studio-quality pictures with a smartphone using a simple setup. The Foldio is a pop-up studio, shrunken for your convenience. White walls and built-in LEDs give just the right amount of light under any conditions. It pulls together in a snap, stays in place with sturdy magnets and when your work is done, folds flat as a pancake. The Foldio 2 makes a 15 inch cube with an extra row of adjustable LEDs and an included light diffuser. It is easy to switch out the included black, white and gray backdrops for impeccable pics of food, craft projects, or your pet hamster, Carl. Make your own backdrops with any paper or fabric. Use the Foldio App to get a green screen effect (no special green backdrop required) and make stop motion videos of Carl flying through space. FOLDIO2 - Foldio is the world's fist portable studio (Mini Studio) with a foldable design. It is unfolding a whole new level of possibilities for both smartphone and regular digital camera photography. 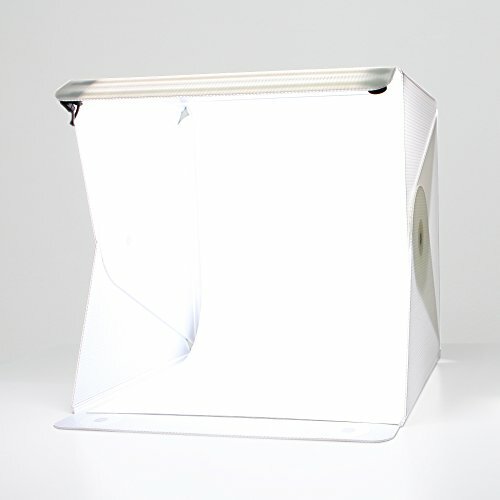 Simply put it is an all-in one foldable and easily portable photo studio that includes all the necessary equipment (light, backdrops and power). Don't worry about taking high quality pictures for your online shop products anymore. This mini studio will help you to solve this problem! LIGHTING - This Mini Studio comes with dual LED strips.The Foldio LED light strips are much more efficient than most LED strips to which you may be accustomed. A built-in dimmer device will help you control the brightness according to your needs. Foldio's basic LED light strip has high brightness LED chips designed especially for Foldio. DIFFUSER - Using the Foldio diffuser helps you decrease the object's shadow. It can also decrease the reflection of the studio light. FOLDIO APP - We have provided a Foldio App. It will help you improve your photographs in several ways: A chroma key function to create great pictures, an easy adjustment for the brightness and a simple way to change the color temperature (available on iOS only for now). If you have any questions about this product by Orangemonkie, contact us by completing and submitting the form below. If you are looking for a specif part number, please include it with your message.